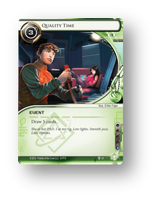 So, you’ve played a few casual games of Netrunner with your friends and enjoyed it. You’ve been to a couple of local game night kits and found that you like taking part in organised events. You decide that you want to go to more tournaments, and to finish well in them. You want to become a competitive player. But how do you go about that? This is my five-step programme for people who want to start down this slippery slope. This will be a long and painful process. You’re probably going to lose a lot of games, at least at first. You may find yourself towards the bottom of the standings at your first few tournaments. Try not to let it bother you and don’t get disheartened. We learn far more from losing a game than winning one. As long as you can look at your loss analytically rather than emotionally it’s not a wasted experience. Of equal importance, you’ll never be so accomplished at this game that you can’t learn something new. No matter how good you think you are, keep looking for ways that you can improve. There’s always another secret. A lot of casual players like to build and play their own decks. They get a buzz out of winning with their own creations, or seeing the cool combo that they found coming off in a game. This is absolutely fine, but is likely to be a handicap if you’re aiming to win. The first mistake that a lot of people that are trying to be competitive players make is taking their own decks to a tournament and then wondering why they aren’t doing so well. Learning to play the game at a high level is already a difficult task, so don’t make it harder for yourself by trying to build the decks at the same time. There are plenty of really strong, tested and tuned decks out there. Find one of those that suits your style and play that for now instead. If building decks is a big part of who you are and why you enjoy Netrunner then I’d recommend keeping a couple of home brewed creations around that you can play at casual game nights; we’ll find a use for them later. To be a competitive player you probably need to know what 99% of cards do without needing to read them. You should be aware of what the best decks are at any given time and what cards you’re likely to see in those lists. You should be on the lookout for tips on how to improve your play, or new ideas that might blindside you if you only see them for the first time in a tournament. You need to thoroughly understand the rules and how cards interact with each other. 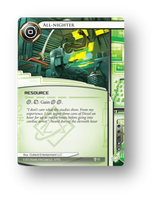 That’s a lot of learning to do, so be prepared for Netrunner to take up a significant portion of your life. I don’t necessarily mean that you need to be up until midnight every day grinding out games online, but you should try to absorb as much information as you can. Talk to the players in your area. Use Slack to talk to players outside of your area, or even from another country. Read articles, listen to podcasts and browse deck lists on NetrunnerDB. Watch videos or streams of tournament games. There’s a huge amount of great content out there. If you’re interested in my personal favourites feel free to ask in the comments! A lot of casual players tend to predominately play one particular faction or style of deck. If you want to be a good competitive player then you’ll need to widen your horizons. Try to play as many different factions as you can. Make sure that you’ve got some experience playing both with and against fast advance decks, combo decks, kill decks and glacier decks. There are a few reasons for this. Firstly, the decks and factions that are good at any given time (a concept usually referred to as "the meta") are liable to change fairly rapidly. If you can only play Noise and HB you’re naturally going to struggle if those identities aren’t well placed. Secondly, playing a deck is the best way to work out how to play against it and that knowledge will come in useful in tournaments. Finally, going through this process will help you learn what decks and factions you’re naturally good at playing, which ones you enjoy, and which ones you’re not so comfortable with. That’s information that will help you when it comes to choosing decks for a tournament, and give you hints at what you need to work on when you’re testing or practicing. If you only take one thing from this article, make sure it’s this one. 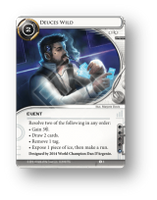 Don’t forget that Netrunner is ultimately a game that you and others have chosen to play for fun. Being a competitive player doesn’t mean you have to stop having fun and if you find that you’re not enjoying yourself as you go through this process then being a competitive player probably isn’t for you. Most importantly, make sure that the other people in your group are having fun as well. If you know someone doesn’t want to grind out testing games against tournament calibre decks then don’t force them to. Remember those fun decks that you built as a protest when I told you to stop being creative? This is the perfect time to bring them out. If you’re worried that this all seems a bit simple, don’t worry! We’re going to look at a lot of the things we’ve mentioned in much more detail in future weeks.